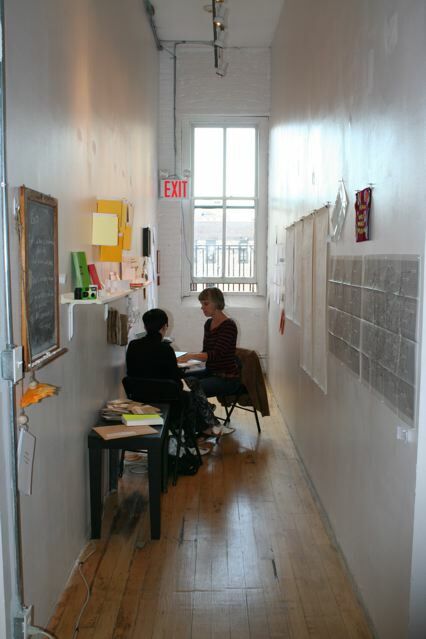 SMALL TALK SMALL BOOKS is a four-day residency/poets retreat taking place in theDEPARTMENT OF MICRO-POETICS. 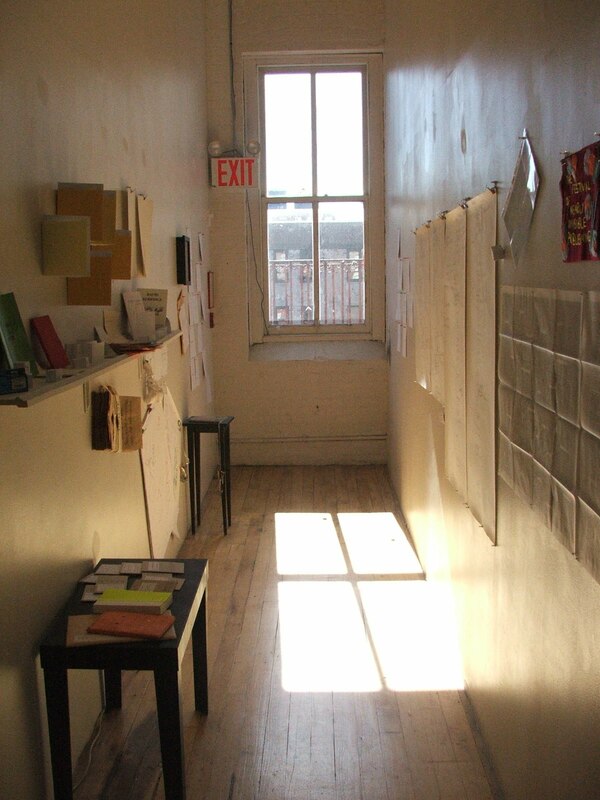 Jill Magi will be in residence for four days, inviting four New York area poet publishers and editors to come and talk informally about poetry, respond to the text works installed in the DEPARTMENT, discuss the relationship between publishing and writing, and chit chat about other topics perhaps not related to poetry. A cross between coffee klatch, talk show, cooking show (where something is made together), and workshop, each SMALL TALK SMALL BOOKS session culminates in Jill and her guest making a small book together. The text for the small book—it may be prose, poetry, a survey, an essay or manifesto—comes out of the time they spend together talking, responding, and doing some writing together. Jill used the DEPARTMENT OF MICRO-POETICS to meet and discuss with Stephen Motika, Jennifer Firestone and Sara Jordeno. The images in this post document the books that were made. These were: PLEASURE IS A TREASURE (w/Jennifer Firestone); direction for how to leave poetry (w/ Stephen Motika) and What did you do with your body or mind? (w/ Sara Jordeno). The original invitation for the residency invited artists to send a letter about their work, and Jill sent the following AUDIO LETTER TO DAVID. The essay was first broadcast as part of VerySmallKitchen’s contribution to WRITING/ EXHIBITION/ PUBLICATION/ PRESENTATION/ DISCUSSION/ PERFORMANCE/ READING/ LISTENING/ SINGING/ PLAYING, curated by Sarah Jury and Ruth Beale for Charlie Woolley’s RADIO SHOW project at SPACE Studios on Oct 6. On October 30th the SMALL BOOKS will be part of VerySmallKitchen’s contribution to SIDESHOW in Nottingham. More info about that project here. Paolo Javier’s residency at the DEPARTMENT OF MICRO POETICS concluded with a talk/ performance on Saturday 16 October. You can see the talk above. Paolo Javier and Robert Jamora also made a MAGIC MOVIE’s of their third and fourth day working in the DEPARTMENT (see below). The movie of DAY ONE can be seen here. A full description of Paolo’s residency can be found here. Paolo and Roberto have also produced the silkscreened, multi-folded first issue of the concluding sequence of obb a.k.a. The Original Brown Boy. An e-chapbook of work produced during the residency is forthcoming from VerySmallKitchen. Paolo Javier sent the above video as a record of his first day in residence at VerySmallKitchen’s DEPARTMENT OF MICRO-POETICS, with Roberto Jamora. Full details of the residency at the AC Institute in New York City can be seen here. The residency concludes on Saturday 16th with a reception at 3pm and a talk/performance at 4pm. During his residency at the Department of Micro Poetics, Queens Poet Laureate PAOLO JAVIER will complete obb a.k.a. the original brown boy, a collaborative multimedia poetry comic begun in 2006 that imagines an octopus and a catfish moving through New York City at the turn of the new millennium. Comic (book art) history, (trans)nationalism, race, and desire are among obb’s many intersections and collisions. The work also foregrounds the presence of the poetic in comic books, and experiments with it in a fragmented text built on/with/from/through illustration, cut-up, collage, video, and painting. Javier will be joined by collaborators ERNEST CONCEPCION, MIKE ESTABROOK, andROBERTO JAMORA throughout the residency, and will exhibit the entirety of their collaboration with a talk and performance on the last day. The work also foregrounds the presence of the poetic in comic books, and experiments with it in a fragmented text built on/with/from/through illustration, cut-up, collage, video, and painting. Javier will be joined by collaborators ERNEST CONCEPCION, MIKE ESTABROOK, and ROBERTO JAMORA throughout the residency, and will exhibit the entirety of their collaboration with a talk and performance on the last day. Paolo will be working in the AC Institute space from Wednesday to Saturday. Join him on Saturday October 16th for a reception at 3pm and a talk/ performance at 4pm. Goldfish Kisses, a fifty five-page chapbook excerpt from obb, appeared in a limited edition published by Sona Books in 2007. Extracts from the project can be viewed here and here. Censorship is a technique of remembrance. And, a heap of negotiation, I kiss you. The absence of text is a question of position. unstable truths and ethical possession. Cost is the backbone of each speech-act. neither to history nor without it. I am against a chair and still in it. I am at a loss for what’s left to describe. this heart through what’s left. Has the heart of shame grinned? Rachel Zolf and Kai Fierle-Hedrick will collaborate – via an on-site/off-site residency at the AC Institute – to write a sequence of poems responding to the exhibition EXCHANGE VALUE. Fierle-Hedrick will write on-site at the gallery, and at the end of each session will forward an ekphrastic poem to Zolf. Responding via The Tolerance Project – a collaborative MFA in Creative Writing rooted in an online archive of “poetic DNA” traces donated by 86 writers, artists and thinkers – Zolf will identify a set of search terms in Fierle-Hedrick’s poem and use these to generate a new response from within The Tolerance Project’s archive. Zolf’s poetic permutation will then serve as the starting point for Fierle-Hedrick’s next session in the gallery, and so on. 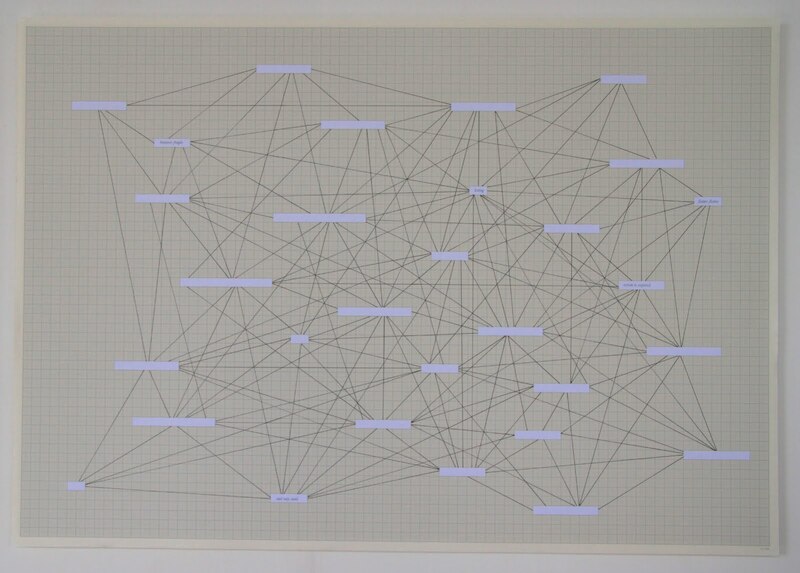 The residency explores a variety of exchanges – ekphrastic, dialogic, technological – in addition to embodying some of the challenges and creative loopholes of distance collaboration. 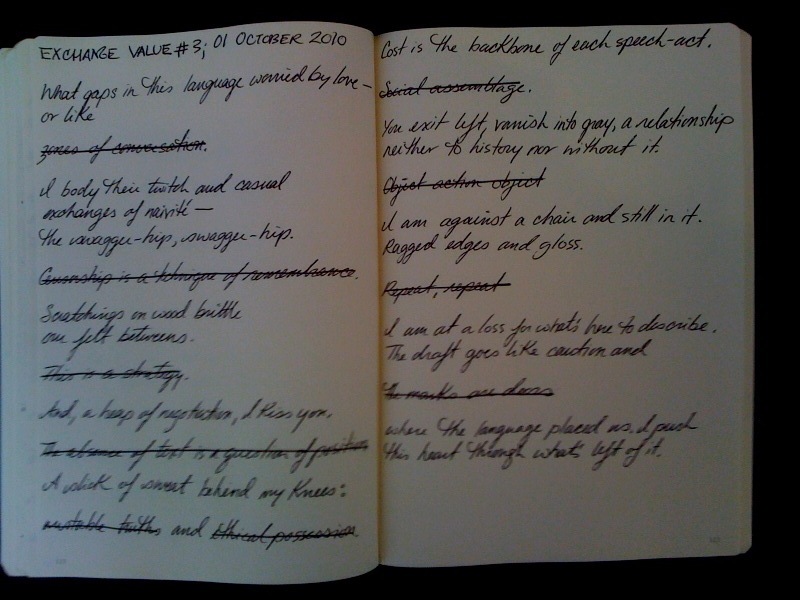 Poems from EXCHANGE VALUE 1 (17 Sep) can be seen here. Poems from EXCHANGE VALUE 2 (24th September) can be seen here. owning each projection troubles it. It(‘)s ease. It(‘)s lack of exchange. I send you the burnt rulebook, who baked that challah? Doesn’t logic depend on tact animated at birth? Can somebody please put the necessary code between my code? The residency concludes on October 1st 2010. The residency continues on September 24th 2010. Kai Fierle-Hedrick and Rachel Zolf will be in residence as part of VerySmallKitchen’s DEPARTMENT OF MICRO-POETICS at the AC Institute in New York City, on Sep 17th, 24th and October 1st. 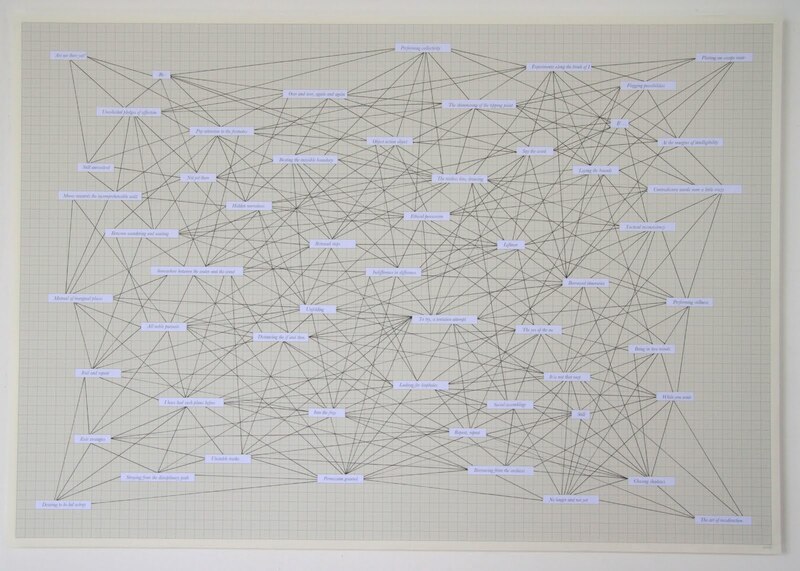 Kai has also contributed an installation to the DEPARTMENT OF MICRO-POETICS based on Exercise 1-11, a series of texts that first appeared in Signals magazine here. The texts are prefaced by a quote by Paulo Freire – “ the child has, at the very least, the right to prove the craziness of his or her idea” – and offer documentation, proposition, and provocation of where experimental poetics and radical pedagogy (hopefully) meet. Eighty-six writers, artists and thinkers have donated their poetic traces to The Tolerance Project, a collaborative MFA in Creative Writing. Each piece of poetic DNA in The Tolerance Project Archive has been assigned its own barcode. 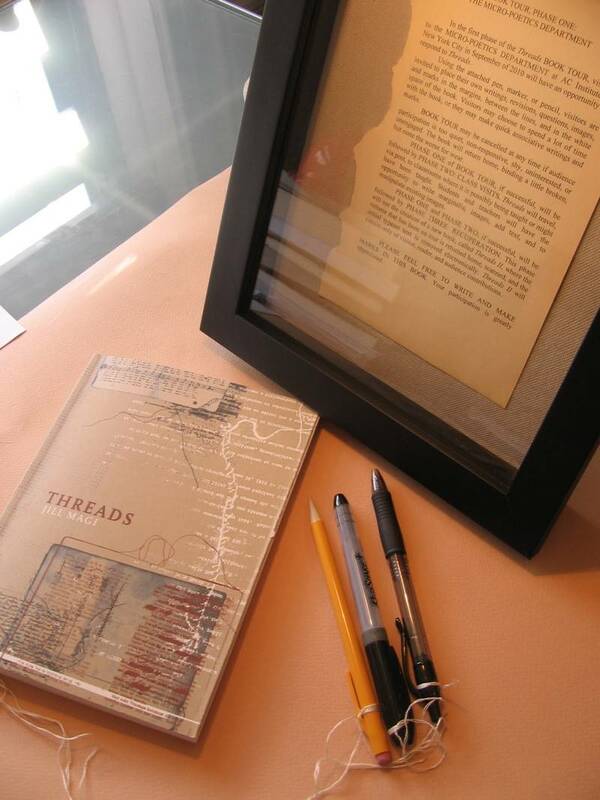 Each poem written for the MFA will employ traces from the donated traces. The MFA poems are restricted to The Tolerance Project Archive for their content. MFA poems written for class will be posted on this blog. Poetic DNA barcodes for the traces used in each poem appear at the end of each MFA poem post. Click on the barcodes to reveal the donor identities and poetic DNA traces. This collaboration includes you. The online public is welcome to use the comments field to give constructive feedback on The Tolerance Project poems. You are also very welcome to browse The Tolerance Project Archive and create your own MFA poems. Post them on the Archive site and if we like them, we may even bring them to class for feedback. Based on cumulative feedback received within and without the institution, the MFA poems will be scrupulously revised toward the creation of The Writing Thesis. To check out the full barcodes and DNA of this poem click the images above or go here. See more about Rachel’s work here, and an interview with Joel Bettridge in JACKET here. 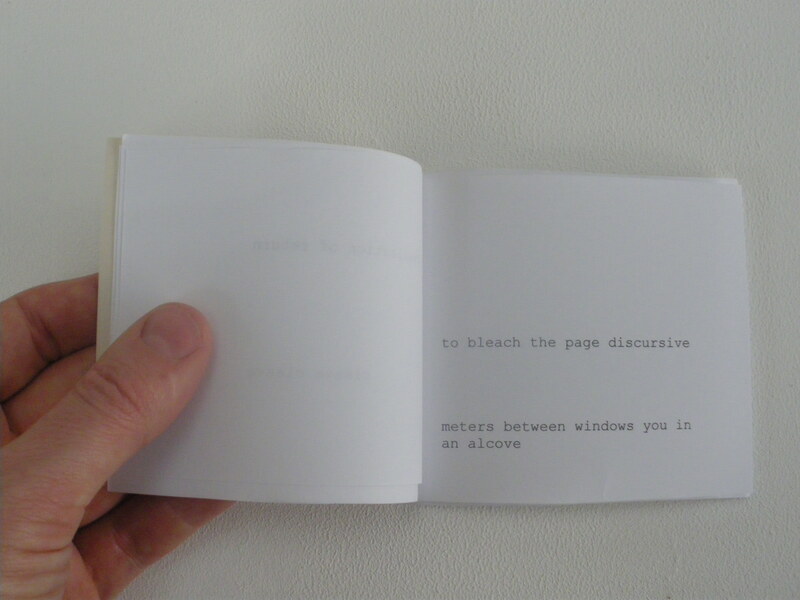 Details of Jill Magi’s SMALL TALK SMALL BOOKS residency are here. Details of projects by Paolo Javier and Vincent Katz to follow. Matt Dalby will perform in the DEPARTMENT OF MICRO POETICS on Thursday 14th October 6-8pm. In July 2010 I invited the Budapest based poet Márton Koppány to contribute to WRITING/EXHIBITION/PUBLICATION, a month long exhibition and residency project at The Pigeon Wing gallery in South London (3 Sep-3 Oct 2010). 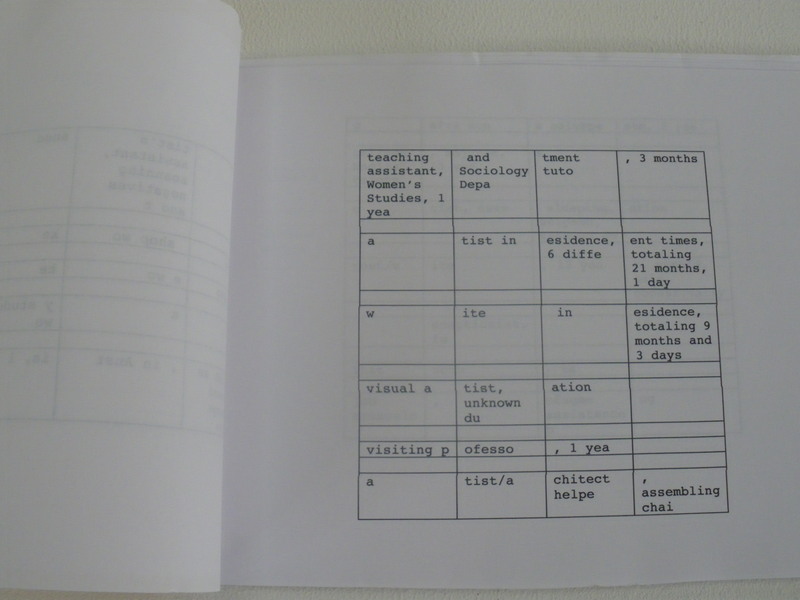 I first encountered Márton’s work through his 2003 collection Investigations & Other Sequences and the online version of the Institute of Broken and Reduced Languages. Thinking about how writing moves (or not) between the different locations of the exhibition title, I returned often to Investigations and Márton’s more recent work, much of it available online. The following is an edited version of an exchange that took place by email between 22nd July 22nd and 18th August 2010. DAVID: Hi Márton. In thinking through your contribution to the exhibition, perhaps we could also have a dialogue by email. Looking at your work, I’ve been thinking about connections between poetry, conceptual art, and the absurd. MÁRTON: In some sense you’ve summarized my own interests/inclinations as well! DAVID: Perhaps we could focus on that phrase. Generally speaking I’m very careful with generalisations and labelings also because I’ve never been good at them. I prefer comments that remain close to a text or situation or a mental condition – and “visual” poetry is a good example of it. You write: “Making connections between traditions of poetry, conceptual work, and traditions of the absurd.” Yes, but they’ve never been separated in a fine work like that of, let’s say, Finlay’s. He had a basic feeling or recognition, which we can analyze now, but I don’t imagine that he ever wanted to add, say, a hint of conceptual flavor to his poems. I mention Finlay here because you respond to his work in your Otoliths piece. Finlay says: “Just so, ‘concrete’ began for me with the extraordinary (since wholly unexpected) sense that the syntax I had been using, the movement of language in me, at a physical level, was no longer there…” And of course nobody wants to sound “absurd” (except for those, perhaps, who participated in a literary movement a few decades ago). I dare to say this because Kafka is my favorite writer. MÁRTON: I don’t want to hide behind my limitations with English and explain away my other limitations through it, but my English is really an obstacle (as you can see). I ask for your (and the potential reader’s) patience. For me it is almost impossible to talk of these kind of things, especially in English – but also in Hungarian. Yes, we should refer to concrete works (of ours and others) as we go ahead, and put them in the focus of our discussion! How does the word “absurd” function for us? Is it an intrusion and a threat or rather a kind of relief? It was both for Kafka, I guess. MÁRTON: Good. (I feel as if I’d always been writing the same poem.) I’d like to do something similar with your work. Could you please send me something over? MÁRTON: I should specify/try to tell again a lot of matters I mentioned yesterday but the core of the thing is that I would like us to begin with the concrete works (with one concrete work that you select from the dozen pieces I’ll be going to send you? ), ask you first to comment on it or ask me about it, and then go on with the dialogue. And it should be YOU who choose a label/frame for my collection in the show. It should reflect YOUR experience with them. I have nothing against “conceptualism” (on the contrary), and “absurd” is as good as “mysterious”. But why don’t we wait a bit with the frame and examine first the concrete works? It is always difficult to decide where to start. Please let me know what you think. DAVID: Yes, lets start from the specifics. MÁRTON: Yes, absolutely. I’m looking VERY much forward to our dialogue – which has already started. (We can find a lot of examples of first step last step “dilemmas” in Kafka, Beckett, George Brecht, Bern Porter, and of course in any dialectic logical system, old or new, and we can perhaps deal with them as we go ahead…) Unfortunately I couldn’t open your zip file for some reason. Could you please send your work again as a Word or PDF document? I’m VERY curious about it! The twelve images Márton sends are: From “Endgames”, Otoliths, 2008: Csend (Silence); The Secret; Ellipsis No. 8; Forecast; Waves No. 2. 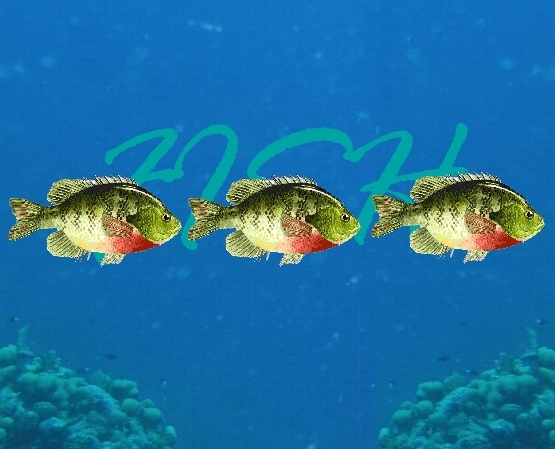 From “Modulations”, Otoliths, 2010: fish 1-3; or; Translation; Vacation; Asemic Table No. 2; Still. I email Marton the manuscript of Kafka Thinking Stations: A Chora(l) Song Cycle. DAVID: I started making these comments after looking at all the images you sent me. Then I picked one, [Waves No.2] as they seemed to fit most specifically around it. Then my thoughts became specifically about this image. I tried to follow a chain of thoughts but – in a way that maybe relates to the images – I think such chains endlessly stopped. I had to re-write, start again, express a similar concern in a different way or through a consideration of some other aspect of the image…. MÁRTON: I’m VERY grateful for your comments, I found them intriguing! But I was in trouble with my responses. DAVID: But the point of starting with an image was to be more concrete! Sorry! Please pick whatever interests you from the rather lengthy notes that follow. MÁRTON: I tried several things in the last couple of days but nothing worked well enough. Whenever I start exposing something to generalizations it becomes very soon unmanageable. (Of course it is my English but not only that.) I have been retreating from textuality for a long time. Even in my Hungarian textual period (several decades ago) my inclinations had directed me toward the (actual, ever-changing) limits of verbal communication. The last half of the sentence is quoted from an interview included in my book of 1993, Investigations. I will use my earlier notes written for different occasions when they are relevant, and when I can’t put it any better. DAVID: I thought about how, in your poems – should I say images? poems? – there are objects at the point of becoming letters. And letters at the point of becoming an object, and what happens when we have this balance. MÁRTON: I started writing something that turned out (?) to be “visual poetry” thirty years ago because by the late seventies I’d understood that if I didn’t want to give up the faint hope of communicating, I should “get rid” of my mother tongue. So the main source of my way is a deficiency, which makes things simple in some sense. I don’t respect/need/enjoy words more OR less than the empty spaces between them, or the sheet of paper they are written on, the rhythm of the turning of the pages, unknown and forgotten symbols, fragments, natural formations like clouds and “objects” found on the internet – each of them and any combination of them may be an invitation. When I feel easy (and ready to make something) I experience their complete equivalence. DAVID: One thing that happens is we smile. Sometimes we smile, and sometimes we laugh out loud. Different kinds of humour, although whether this is something we can control, in the creation of such works, I don’t know. I sometimes think it is your humour , as maker of this, that the poem evidences, – and when we smile or laugh we recognise how much we participate in your humour. MÁRTON: Hope you’re right. Concerning humor, what I think in this quite humorless period of my life (I wrote in 2001) is that I have two basic states of mind. One is the suffering/confused, when I can’t write at all. The other one – which is more exceptional and keeps sometimes only for a few moments – is the happily confused one, when I can somehow cling to the air and enjoy the panorama. But if I write (or more exactly: take) down what I see (which doesn’t happen too frequently), the composition generally gets humorous because suffering and confusion are still present and I see myself in the air. The only relief is that I can accept all those contradictions, at least for the moment, and humour is perhaps just accepting contradictions. DAVID: Another thing that happens, as objects become letters and letters become objects, is that we make a picture. A boat on the sea. Sort of. We also make a setting. A photo of sea. An artificial sky. Now the balance is between things we think of as landscape and nature, and things that seem a flat surface of colour, something made on the computer. The image is called WAVES. Perhaps this highlights that the zone of importance is more than letters and punctuation, which could otherwise be the figure to the seas ground. Is this more all over focus where the desire to work in colour came from, after the black and white work of INVESTIGATIONS? Do you still work in black and white? I suspect not. It feels to me, without knowing if this is so, that some definite break happened. MÁRTON: I’m still working in black and white as well, but you’re basically right, most of my pieces since 2005 have been in colour. When I understood how isolated I was in (or rather out of) the state-controlled culture, I felt I should “leave” my mother tongue behind and reach out. That was at the end of the 70’s. I got involved in mail art, started making collages and writing extremely minimalistic poems on small cards. I tried to metacommunicate with the potentials of the sheet of paper itself (it can be torn etc.) and with sequentiality. Color visual poems date back only to 2005, when, all of a sudden, I started seeing color punctuation mark landscapes during a walk. Generally I have a basic image first which just emerges. But most of my visual poems significantly (or completely) change in the process of their elaboration, thanks to the call coming from the unexpected “blemishes” of their digital carriers. It is a dialogue, I hope. Could you please explain to me, what kind of break you meant? When you’re doing something day after day (in my case rather month after month because I’m very slow and produce far fewer items than most visual poets do), you don’t recognize the shift which might be evident for an attentive observer. 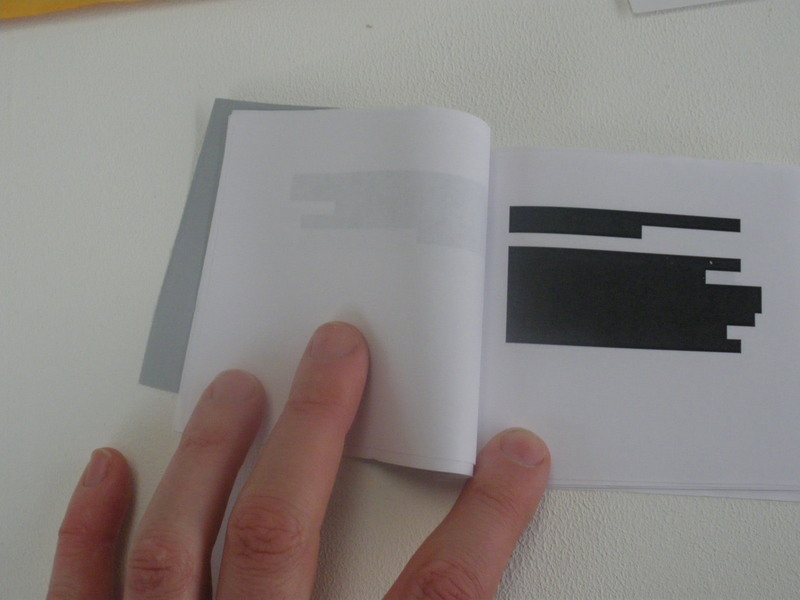 I do feel that my “images” are even more silent than my similarly minimalistic conceptual sequences were. And they might seem in some cases a bit less “poor”. But my “problems” are basically the same. I was thirty years younger when I wrote the bulk of my black and white sequences. Well, that’s a real difference. DAVID: If we try to row away in the boat, we discover that it is made of punctuation! (Of course, we always knew this really) If we find a way of making this punctuation boat work, we discover this bit of sea isn’t connected to anything else, although it sort of promised it was, or we kidded ourselves that this was the case. MÁRTON: I can only add that since this is a visual poem and has two dimensions (I framed it to emphasize the fact) (although recently I’ve stopped using frames), it has a vertical reading as well: a white (erased?) (already “missing”?) 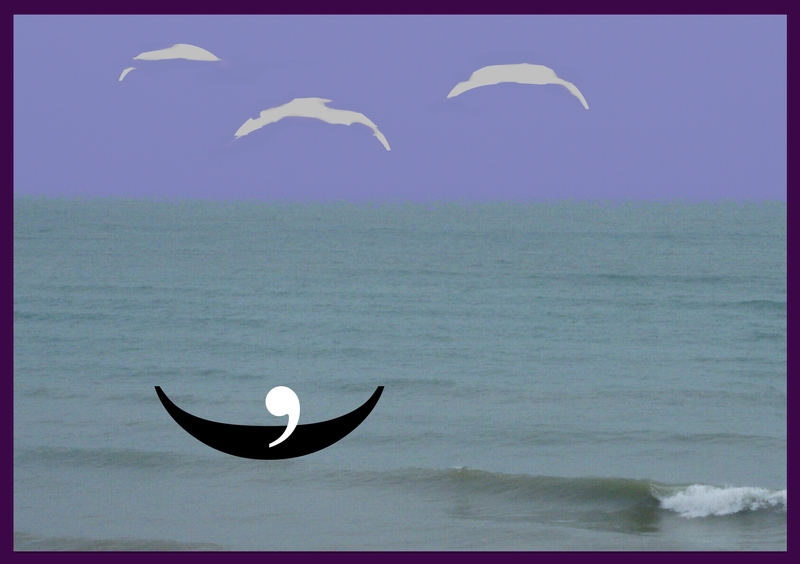 comma-man is sailing, quietly, in a small black boat consisting of an opening bracket, and under a series of opaque closing brackets consisting of some fleecy clouds in motion. 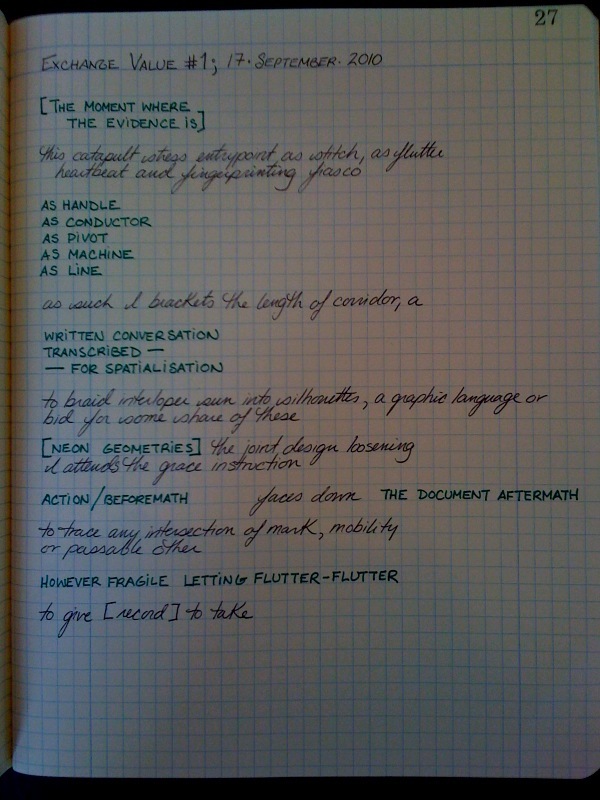 DAVID: I’ve started writing my notes as “We…” Perhaps “we” navigate into such an images as this on the basis of what we share (punctuation, colour, sea), not on the basis of our individual personalities. MÁRTON: Yes, you’re absolutely right as far as my intentions are concerned. I don’t want to express anything more than a balance and the lack of it, the mystery “and” absurdity (they’re not “and”, not separated) of… (You know this “of”: you made it talk in your Chora.) What remains if I abstract away from the anecdotical and psychological details of my personal history? Certainty of Death and Certainty of Nothing at All are playing ping-pong in the final of an elimination tournament. MÁRTON: I have no idea. But – how to put it? – it is certainly not about language. (My intuition, based on “Chora” is that your main interest is also different. They spring directly from a strong sensation (recognition) (or a sensational feeling of no recognition). They “talk back” in the process of realization and (in good case) surprise me. At that point I’m done. The less is the better. DAVID: … Simultaneity and development. Between surface and depth, 2D and 3D. MÁRTON: Yes, the surface. We need it, don’t we? I don’t want to imitate 3D (to compete with computer games etc. ), but some of my pieces suggest three dimensionality – or use its concept. Nothing can be repeated: the original version of Waves was done in an early period of my digital activity when I had no idea what pixels mean. (I’m still low-tech.) So that version doesn’t exist in higher resolution. In 2008 I reshaped it, and the resolution of the new picture is much higher. It is a bit different / it is the same. Generally speaking my works are rather conceptual but not completely. DAVID: I did a theatre workshop once where they said to move slowly means having an attention that is very fast and moving all over the body. To move fast requires that attention be very still and slow. MÁRTON: Yes, that’s absolutely true! DAVID: In trying to be concrete I’ve emphasised the positive, playful side of these images, but they could also be read as about impossibility: the disaster of making a boat from letters. What determines whether we read such images for their positive or negative meanings? It really depends on the reader. It will sound idiotic but I vote for harmony. To “work” on these poems, I mean to catch the basic image in the air, has always been a positive experience for me. 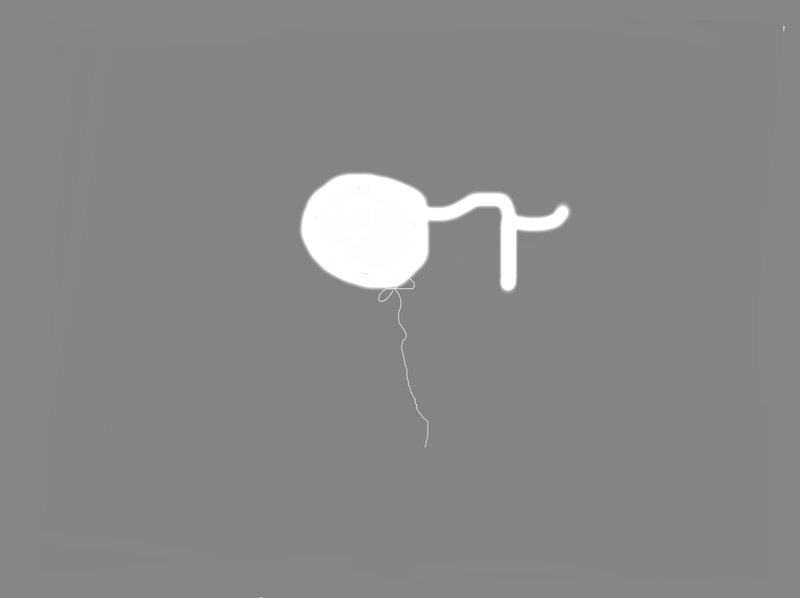 I can never create anything when I’m depressed or angry. I need momentary easiness to be able to present that coin – on whatever side of it is more emphasis at the moment. What does it mean? DAVID: Perhaps the clue is in the title. WAVES. As in “someone waving.” Poem as greeting. DAVID: I am thinking about a scene near the end of Tarkovsky’s Solaris. Have you seen it? If so, maybe you know the scene I am thinking of? MÁRTON: I’m a bit ashamed but I left it out. And on top of it all I worked as a film critic for many years in the late eighties and early nineties! I’ve hardly gone to the movies (or watched video) since then. I skipped a few parts of your letter because I couldn’t relate to them for the moment. DAVID: I am at my parents house tonight. My mum shows me a small notebook belonging to her grandfather. She says all it contains is some blank pages on which are written his union membership number and names of some horses he wished to bet on. This is the only writing or object that remains of her grandfather. MÁRTON: I could relate to several comments of yours, because our dialogue is potentially open in many directions. But we are getting farther and farther from the concrete pieces. (Only one of them has been touched yet.) I must repeat that I’m totally sceptical about general talk over art. My reactions would be meaningless without the momentum (if any) of the concrete poems. If that momentum doesn’t exist, my ideas have no importance. I’d like to stay as close to the poems as possible. We could turn back to them. But since both of us have other obligations we could also claim that our text is done – at least for the time being. MÁRTON: No, no, nothing has been “inappropriate” at all! I’m simply not good at general talk – I lose the thread quickly. DAVID:I have begun editing our emails, but I would also like to try and stay with this little “knot” or “crisis” in our dialogue. MÁRTON: Others might be different, and that’s fine. I’m happy to talk about any topic (also about poetry and exhibitions) as far as we remain in (or at least close to) the context of the concrete work(s). DAVID: I feel trapped in a somewhat paradoxical activity: trying to articulate in language that which is at the “limits of expression” and moving beyond the verbal. But not wanting to have a sense of “reclaiming” it, or simplifying it in any way, nor to set up a “mystery” of the image…. MÁRTON: You are right, it is a paradoxical activity, but even walking is a paradoxical activity according to Zeno. Some Chinese sources call this use of language “liminological speech”. But the limit is always “somewhere else”. What I mean is that there’s no “beyond” (at least not in my vocabulary, but it can be fine and meaningful in other cases). Seeing is still reading, reading is seeing. Words can be mute, while clouds, table legs and water waves, subatomic letter particles can easily start speaking because they’re words AGAIN, signs among signs. I’ve been inclined to use less and less verbal elements, but it is a mental process, which I’ve experienced and also witnessed. There’s no methodology involved. Perhaps I’m simply getting older. And as I wrote you in my previous message, I have NOTHING against verbality: if there’s anything I really admire it is first class, pure textual poetry!!! Unfortunately I can’t afford it because I’ve lost my mother tongue and the capacity of articulate speech. No “mystery”. I’ve remained (or would like to be) a writer. These are are given an order and movement that is also like that of the metronome in Ellipsis – it has a pace, a measure, a rhythm – things with a tone, also an instruction for another activity. MÁRTON: My work is rather conceptual but my concepts are completely intuitive (there’s no theory behind them), and I’d like to show both. That might have a (dysfunctional) machine-like precision effect in some cases. MÁRTON: “Still” is the reflection (in the water) of something which can’t be seen anymore. “Still” is its only presence. And it is “still” present!!! DAVID: A shifting sense of “nature.” What do categories like nature and artifice mean when brought into the image? 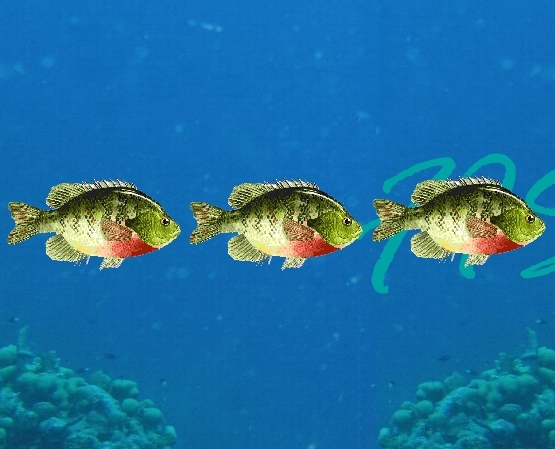 It is something to be played with, and also a way of organising the images: Fish in water and fish in the sky; fish breathing and fish having thought balloons/ clouds/ trees, like we associate with cartoons. 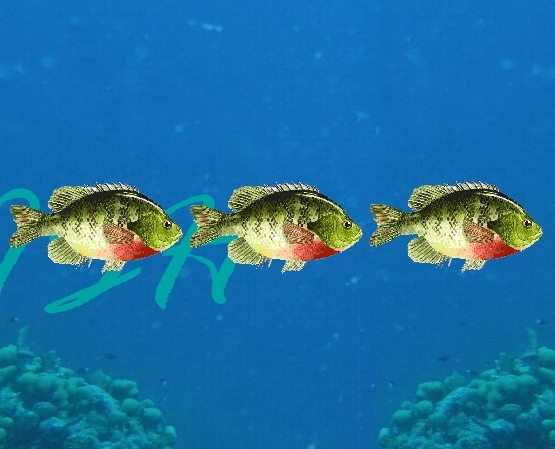 MÁRTON: Yes, some motives – like the fish or the clouds – have been coming back in different contexts. I like to modify (or completely change) their role: against my own expectations with naming, categorizing etc. DAVID: You talk about “silence” in colour images. I think the silence is to do with these gaps, and your manipulation between them. 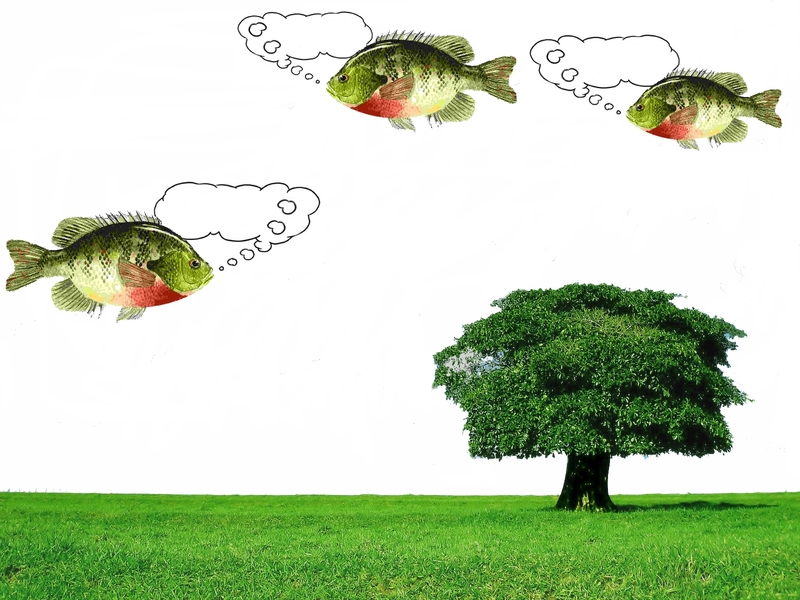 Fish…sea…sky…thought balloon… cloud…tree… a certain spectrum (of the comedy/conceptual/absurd) maybe? MÁRTON: I can’t add anything else! DAVID: Does it feel reductive to you to talk of a grammar? A set of elements that are identified and explored in repeated ways? In your work it seems more intuitive than this. A repeated image (like the comma emergent from a block of colour) has to be found each time? DAVID: And the titles are a curious element in a practice trying, as you say, to “retreat” from the literary. Sometimes – Forecast- they seem to offer a clarification. Other times, Ellipsis or The Secret – it is more transformative to read the title after looking at the image. The titles are a bit like the purple frame perhaps? Have you ever made an untitled work? MÁRTON: Yes, the function of the titles is different in each case. Sometimes they’re very neutral, like, say, “Study No. 3” or “Sans Titre No. 1”. I need them only to slow down a little bit. In other cases they’re important (even core) elements of the composition. There’s no rule. DAVID: I imagine a reversal: the image as the title, and the title as a miniature poem underneath – like Ian Hamilton Finlay’s one word poem issue of Poor Old Tired Horse where the title could be any length! MÁRTON: Absolutely! I have a sequence in Investigations, titled “Titles”, where the title becomes the picture and vice versa. DAVID: It feels appropriate that The Mist got separated off in an email by itself! It has a feeling of ending, opposites, and reversals. The object of the suitcase also highlights something about (human) presence and absence that recurs in these images, a referencing and avoidance of the body; journey/ progress/ accumulation alongside nothingness/emptiness. MÁRTON: I like a lot your interpretation! MÁRTON: Yes, I feel the same. I’m VERY happy that you’ve noticed it! MÁRTON: I still use white space (it has central importance in “Still”, for instance), but it has become one “color” among the others. White, whiter, color. My frames, as many things in life, came from a coincidence. In the late 70’s when I started tinkering with my first non-just-textual black and white sequences, I cut the xeroxed A/4 pages into four because I wanted to put my work into normal size envelopes and send it out as mail art. But it was difficult to handle the borders without frames, so I glued the originals on black cardboards, and it was convenient to keep the frames as well. Very soon I became conscious of their presence. They started to represent limitations – and the opportunity of changing them into a playfield. I noticed another white layer “behind” the black one – and also that there is no “background” anywhere at all. MÁRTON: David, now that we have more material on the concrete works, I can turn back to your more general comments, and try to make short reflexions. DAVID: How would you characterise your education? Did you have an apprenticeship? Is writing solitary? MÁRTON: I’m an economist by profession. I’ve never used my degree. I worked as a film critic for several years. I’ve been translating and editing for a long while. DAVID: I’ve been reading the work collected as part of the Institute of Broken and Reduced Languages. Could you talk about this idea of the individual working as organisation? I’ve been organising a project called DEPARTMENT OF MICRO- POETICS, so I’ve been thinking through the implications of carrying out poetic- artistic activities under such a banner. It came from the wish of finding an umbrella different from labels like “concrete” or “conceptual”. DAVID: For myself, I’m not copying an institution, or satirising it, so much as trying to create something which is a container and prompt for my work and can also be an invitation to others. MÁRTON: During the nineties I had the opportunity to bring out a series of small books in collaboration with a small press in Slovakia. (And a couple of magazine special issues with the same publisher.) At the beginning of new millennium the Institute went online. Karl Young, the poet and essayist gave it a new home at his Light and Dust Anthology, and agreed to co-edit it. Unfortunately it hasn’t been updated for a long time. And one more “organization”: with Nico Vassilakis I coauthored a book titled From The Annual Records of The Cloud Appreciation Society. We needed somehow the bureaucratic base – to leviate. A bit later we (or rather our publisher) had some surrealistic debate with the “real” organization wearing the same name. DAVID: I’m wondering about poetry in exhibitions, poetry as art, poetry exhibited, and writing as an art practice as opposed to a poetic practice. Do you have any sense of this in your own work? MÁRTON: I’ve participated in several shows (the first one was a group show for Eastern European book artists at Franklin Furnace in 1982) and I would be happy to exhibit more. I like the gallery context as much as the book context. Both have their advantages. I can’t fathom the difference between a “text artist” and a “visual poet” in that respect – why on earth one of them inhabits the gallery place, meanwhile the other one is living in books. It is a social game most of all. I don’t see any aesthetic difference. In good case we are motivated by the work to see the pages of the book and read the images on the wall. It shouldn’t be mythologized. And turning (clicking) the page is not so different from moving between the elements of an installation. Both connects and separates. Kitasono Katue’s Magic (in oceans beyond monotonous space; edited by Karl Young and John Solt) is printed on two pages (and should be read in columns, and from right to left). First we have the block of “ocean of ocean of ocean…”, then a single column follows: “a graceful novel and a graceful novel for a novel and a distance between me and all of you”. Next comes the block of “light on water light on water light on water…”. But the flow of the columns of that block stops at the page break. Then it continues on the opposite page, ending in the middle of it. So where can that “graceful novel” and that “distance” be found exactly? DAVID: WRITING/EXHIBITION/PUBLICATION asks if writing moves fluidly between these different spaces, and/or if there are blocks, stoppages, distinctions between these different locations. MÁRTON: I think it is totally fluid. “Bourdieu has long drawn attention to the fact that – always a matter of frustration to anthropologists – a truly artful social actor is almost guaranteed not to be able to offer a clear explanation of the principles underlying her own artistry. MÁRTON: I like this! With the extension that of course it is true about philosophers as well. And that is why we (still) can’t do without metaphors. DAVID: I’m interested how much or how little could be satisfying in making an image. MÁRTON: It is very satisfying! In a sense I’m really grateful for my “deficiency”. MÁRTON: No, it is just the same realm. Or we have been “beyond” from the very beginning. DAVID: Does writing feel practical to you? I often have a sense of a “utility” of writing, a need for it to be “useful.” But I’m not sure quite what uses I have in mind. MÁRTON: It is “the support of contemplation”. Very useful! (Nothing is more useful for me.) It can totally change our initial ideas, or give them an unexpected twist. DAVID: Our starting concept for this exchange: A PRIMER ON POETRY, THE CONCEPTUAL, AND THE ABSURD. How do you think we’re doing? MÁRTON: Please choose a title for our text: it should be the last phase of your editorial work, I guess, and should reflect your experience with it and with the images… I’m curious. I’ve already found a couple of things that should be corrected in my last two responses. (For instance: I’m not an economist “by profession”, rather “I studied economics but never used my degree”) etc. etc. You can also find a few details confusing (thanks to my English) – and I’ll try to recompose or clarify those details. It would be good to keep the dialogue form, I guess, because each response emerged from a concrete question, and they belong together. DAVID: I’ll edit this while you are on holiday and send it by Friday. 2. Asemic Table No. 2 is a comment on Tony Trehy’s Reykjavik. 3. The Investigations interview was conducted by Jesse Glass. As well as a reference list of books mentioned in this exchange, the following is also a list of texts exchanged by the authors. David Berridge, Kafka Thinking Stations: A Chora(l) Song Cycle (The Arthur Shilling Press, 2010). David Berridge, The Moth is Moth this Money Night Moth (The Knives, Forks and Spoons Press, 2010). David Berridge, Nutshell Axioms: An Experiment in Reading as Essaying, in Otoliths, Winter 2009. Kitasono Katue, oceans beyond monotonous space: selected poems of Kitasono Katue, ed. John Solt and Karl Young (highmoonoon books, 2007). Márton Koppány, Immortality and Freedom (Coracle Press, 1991). Márton Koppány, To Be Or To Be (The Runaway Spoon Press, 1996). Márton Koppány, Investigations & Other Sequences (Ahadada, 2003). Márton Koppány, Endgames (Otoliths, 2008). Márton Koppány & Nico Vassilakis eds. From the Annual Reports of the Cloud Appreciation Society (Otoliths, 2008). 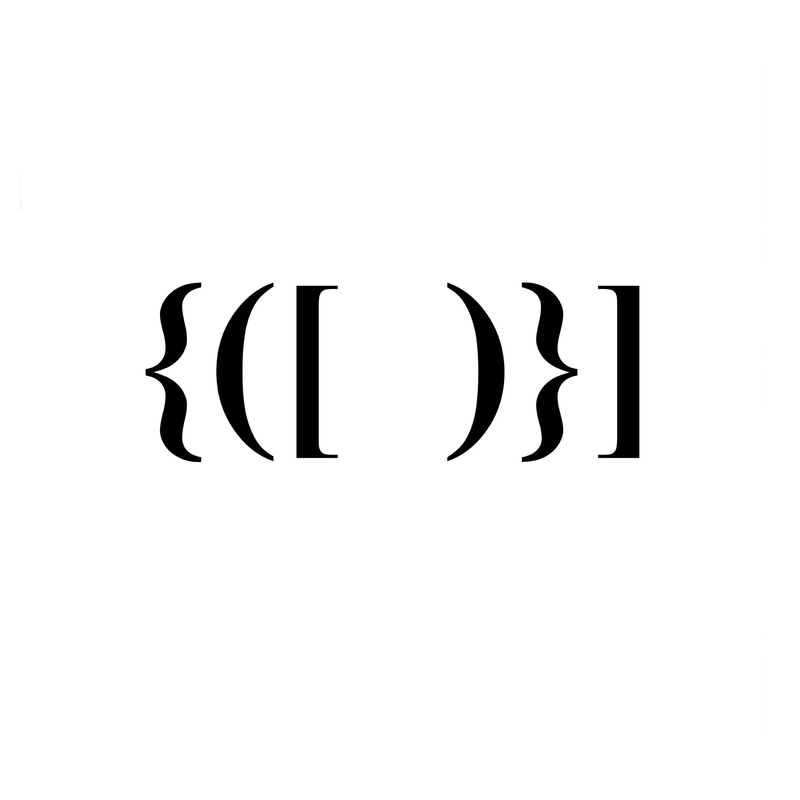 Márton Koppány, Modulations (Otoliths, 2010). Jill Magi will be the first artist in residence at the DEPARTMENT OF MICRO-POETICS, VerySmallKitchen’s long distance residency at the AC Institute, New York. Jill will be in the space on Sat 11th, Wed 15h, Thurs 16th, and Sat 18th September, conducting her project SMALL TALK SMALL BOOKS. SMALL TALK SMALL BOOKS is a four-day residency/poets retreat taking place in the DEPARTMENT OF MICRO-POETICS. Jill Magi will be in residence for four days, inviting four New York area poet publishers and editors to come and talk informally about poetry, respond to the text works installed in the DEPARTMENT, discuss the relationship between publishing and writing, and chit chat about other topics perhaps not related to poetry. The small book will be formatted there on the spot, printed out in a small batch, and stapled together. Copies of these books–a small box set–will be kept at the DEPARTMENT “on file,” and sent to the U.K. for The Pigeon Wing sister exhibition. Others will be distributed under the auspices of SONA BOOKS, a chapbook press organized by Jill Magi, and also according to the poets’ desires. More about Jill’s work can be found on her website here, which documents both her own written and visual work and that of her small press, Sona Books. Her book TORCHWOOD is published by Shearsman books. Recent projects include the unfolding “text-image work-in-progess” LABOR, excerpts from which can be seen in PEEP/SHOW and Critiphoria. A correspondence with Cecilia Vicuna, part of the Letters to Poets project, can be seen here. 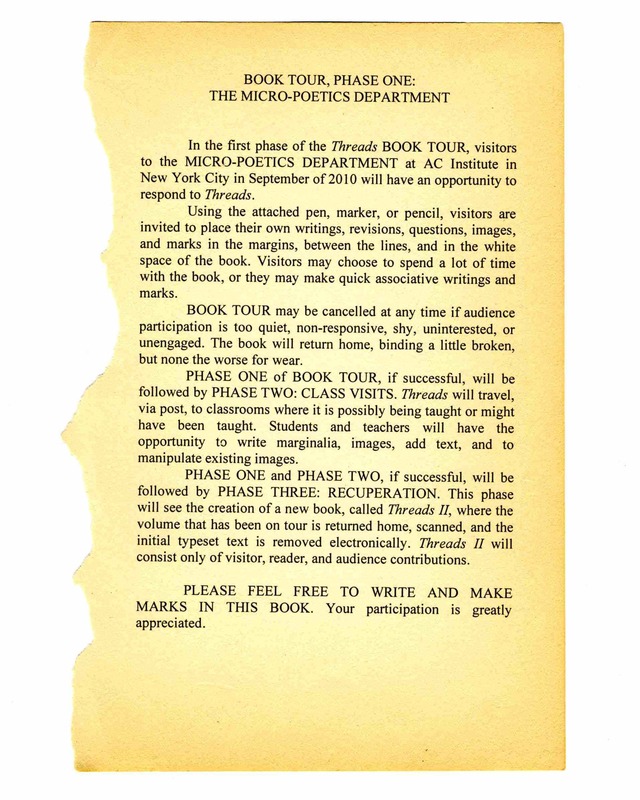 More information on The Department of Micro-Poetics can be seen here. Future residencies will include Kai Fierle-Hedrick and Rachel Zolf, and Paolo Javier. More info to follow.